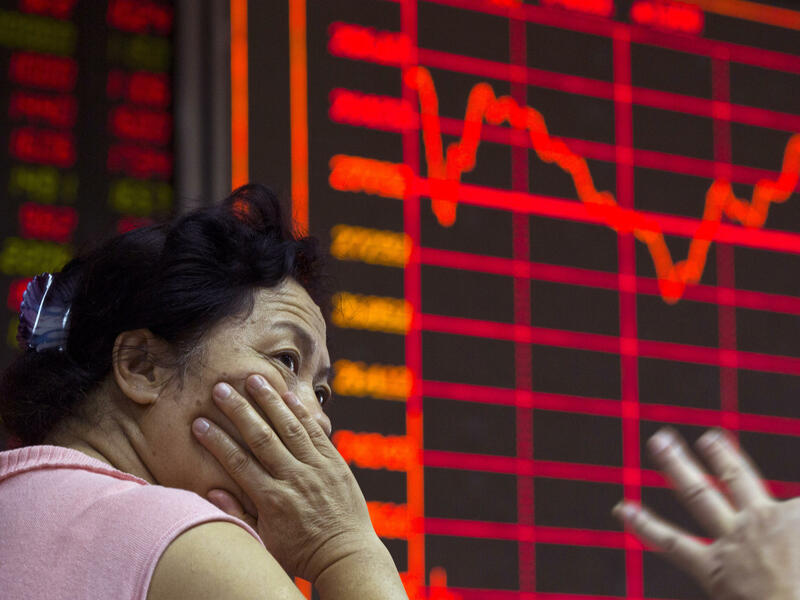 A Chinese investor monitors stock prices at a brokerage in Beijing on Wednesday. The country's stock markets have nosedived. China's government has had a rough summer. Officials have tried and failed to stop the country's stock markets from nosediving. Both the Shenzhen and Shanghai exchanges closed down again today. Earlier this month, the government announced a surprise devaluation that rattled global markets. Economists see these as odd, unforced errors by a government that built its reputation on shrewd economic management. The picture appears even worse when you consider the recent Tianjin disaster, where it was revealed that local corruption led to chemical explosions that killed more than 100 people. All this has some analysts wondering: Is China's Communist Party losing some of its touch? Outside a stock trading hall in the heart of Shanghai, people are trickling in for the afternoon session to see where stocks are. Chen, a retired laborer who used to work in a watch factory, has been looking at the market closely. One of his criticisms is that state and commercial media have encouraged people to keep investing in the market and actually helped create the bubble. "This is the product of an economy where officials and businessmen collude," says Chen, who doesn't want to use his full name because he's discussing something politically sensitive and criticizing the government. "Those editorials are just ripping people off. Those big capitalists use the mainstream media to confuse ignorant people and get them into the market and to rob the society of its wealth." Harsh words. But economists are almost equally blunt these days. "In the stock market case, I think the government was really incompetent on several levels because they were actively promoting something that was really bad economically," says Arthur Kroeber, the head of research at Gavekal Dragonomics, a Beijing-based economics research firm. Why would officials do this? Fraser Howie, an author who's spent nearly 25 years studying Chinese markets, says the government pumped up stocks in hopes of boosting China's economy, where growth is slowing. "I think what the government was trying to do — which I think was stupid — but I think what the potential rationale was, [they] were hoping for a wealth effect through the stock market, and that can ignite a growth story as well." Kroeber says when stocks went south, the government lost its way. "They first encouraged an irrational bubble," he says. "Then they tried, unreasonably, to protect the market from the consequences of its own excesses. And then, having done that for two months, they kind of gave up." When the government devalued China's currency earlier this month, its performance was no better. Officials didn't immediately spell out their motives — sparking fears that China's economy was in worse shape than it appeared. "What they should have done is said, 'Here's why we're devaluing the currency, here's why we're only doing it a small amount,' " says Andy Rothman, an investment strategist for Matthews Asia, a San Francisco-based firm that focuses exclusively on Asia. "And that would have put people at ease, rather than having the resulting chaos in stock markets around the world." And then there were this month's explosions in the port city of Tianjin. David Bandurski, a researcher at the China Media Project at the University of Hong Kong, followed the government's response to the blasts that killed more than 100 and left more than 700 injured. He says officials tried to censor information and craft a narrative that focused on heroic first responders. But citizens began asking questions online, and commercial media exposed government malfeasance that contributed to the disaster. Bandurski says the government just couldn't catch up. "The authorities, in this case, completely lost the story," he says. "There was no way they could impose a larger narrative on it." Why has the government made missteps this summer and struggled to manage its message? For one thing, it's harder and harder to control information in the information age — even in authoritarian China. But there is another reason, Kroeber says: Government officials are at odds on how to handle the economy and slowing growth. "There is very clearly a deep division within the government about how much structural economic reform needs to be done, and this is not a debate that has been clearly decided from one side or the other," he says. "So when you look at it from the outside, it looks like confusion." China has built a massive economy with its own special brand of capitalism. It is centrally managed capitalism. Events of recent months have raised questions about the quality of the management. Analysts tracking the global stock market drops of recent weeks have identified a surprising factor. The trouble is not exactly that China's economy is slowing. People have seen that coming for long time. Analysts identify something a little different. GREENE: It's a sense that China's leadership doesn't seem to know what to do about the economy. Repeated efforts to prop up the stock market haven't worked. Earlier this month, the government announced a surprise currency devaluation, and local corruption recently led to a chemical explosion that killed more than a hundred people. NPR's Frank Langfitt reports on whether China's Communist Party is losing some of its touch. FRANK LANGFITT, BYLINE: I'm standing outside a stock trading hall in the heart of Shanghai. People are trickling in for the afternoon session to take a look at the board, see where the stocks are. And a moment ago, I was talking to a man named Chen. He's a retired factory worker. He used to work in a watch factory. He's been looking at the market pretty closely and one of his criticisms is that state and commercial media encouraged people to keep investing in the market and actually helped create the bubble. CHEN: (Through interpreter) This is the product of an economy where officials and businessmen collude. Those editorials are just ripping people off. Those big capitalists use the mainstream media to confuse ignorant people and get them into the market to rob the society of its wealth. LANGFITT: Harsh words, but economists are almost equally blunt these days. Arthur Kroeber is head of research at Gavekal Dragonomics, a Beijing-based research firm. ARTHUR KROEBER: In the stock market case, I think the government was really incompetent on several levels 'cause they were actively promoting something that was really bad economically. LANGFITT: Why would officials do this? Fraser Howie says the government pumped up stocks in hopes of boosting China's economy where growth is slowing. Howie's an author who's spent nearly 25 years studying Chinese markets. FRASER HOWIE: I think what the government was trying to do - which I think was stupid - but I think what the potential rationale was, they were hoping for a wealth effect through the stock market, that that can affect or ignite an economic growth story as well. LANGFITT: But Kroeber says when stocks went south, the government lost its way. KROEBER: They first encouraged an irrational bubble, then they tried, you know, unreasonably, to protect the market from the consequences of its own excesses. And then having done that for two months, they kind of gave up. LANGFITT: When the government devalued China's currency earlier this month, its performance was no better. Officials didn't immediately spell out their motives, sparking fears that China's economy was in worse shape than it appeared. Andy Rothman is a strategist with the Asia-focused investment firm, Matthews Asia. ANDY ROTHMAN: What they should've done is said here, we're devaluing the currency. Here's why we're only doing it a small amount. And that would've put people at ease rather than having the resulting chaos in stock markets around the world. LANGFITT: Economists see these as odd, unforced errors by a government that built its reputation on shrewd economic management. And then there were the explosions in the port city of Tianjin. DAVID BANDURSKI: My name is David Bandurski. I'm a researcher at the China Media Project at the University of Hong Kong. LANGFITT: Bandurski followed the government's response to the explosions that killed more than a hundred and left more than 700 injured. Officials tried to censor information and craft a narrative that focused on heroic first responders. But citizens began asking questions online, and commercial media exposed government malfeasance that contributed to the disaster. Bandurski says the government just couldn't catch up. BANDURSKI: The authorities in this case completely lost the story. There was no way they could impose a larger narrative on it. LANGFITT: Why's the government made missteps this summer and struggled to manage its message? For one thing, it's harder and harder to control information in the information age, even in authoritarian China. Arthur Kroeber says there's another reason - government officials are at odds on how to handle the economy and slowing growth. KROEBER: There's a very clearly a deep division within the government about how much structural economic reform needs to be done. And this is not a debate. It has been clearly decided for one side of the other. And so when you look at it from the outside, it looks like confusion. LANGFITT: And perhaps on the inside as well. Frank Langfitt, NPR News, Shanghai. INSKEEP: So that is the view of analysts watching China. Transcript provided by NPR, Copyright NPR.